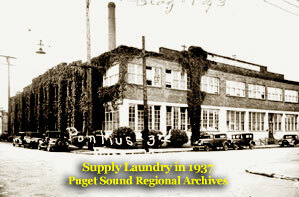 At the time of its landmark designation, no other pre-World War I power laundry embodied the structural integrity of the Seattle Empire Laundry. However the city possessed a rich trove of historic laundry sites, many of which played an important role in its growth and industrial history. This was recognized once again in 1999, when concerned community members fought to have the New Richmond Laundry designated a Seattle landmark. They were in the unique position of opposing a landmark nomination that asserted the building in question did not meet the criteria for designation. They managed to achieve designation for the New Richmond - but other onetime power laundries have not fared so well. 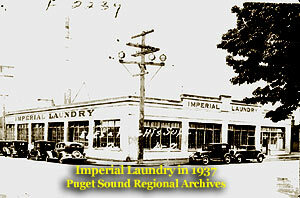 Above left: The Imperial Laundry (1913) at 1215 E. Columbia St., was a one-story laundry of the pre-World War I period. However, in 1941 an addition was added and by 1998 all its windows were bricked up and the chimney sat almost destroyed. Above right: The Supply Laundry at 1265 E. Republican St. initially handled only family laundry - ads billed Supply as "The Big Family Laundry". The business was founded in 1904; these premises were built in 1912. Their second story was added in April, 1914 (permit #131546) at a cost of almost $20,000. "The entire story", noted Pacific Laundryman, "will be used as a starch room. The flat work will all be done on the first floor". In 1925, there was a further addition, 26' x 70', and two stories in height (permit #243181, cost $12,000); this included the boiler room. The construction of a radial brick smokestack followed in 1925 (permit #245059, cost $3,800); the stack became a neighborhood landmark of the Cascade district. During 1943, Supply was acquired by New Richmond Laundry, Inc. By 1998, the first floor of its north facade had been altered, as had the northeastern corner. Yet the majesty of its pre-World War I industrial beginnings remained. 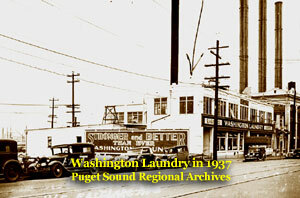 Above: the Washington Laundry at 1165 Eastlake Ave (1909) was also a pre-World War I steam laundry. 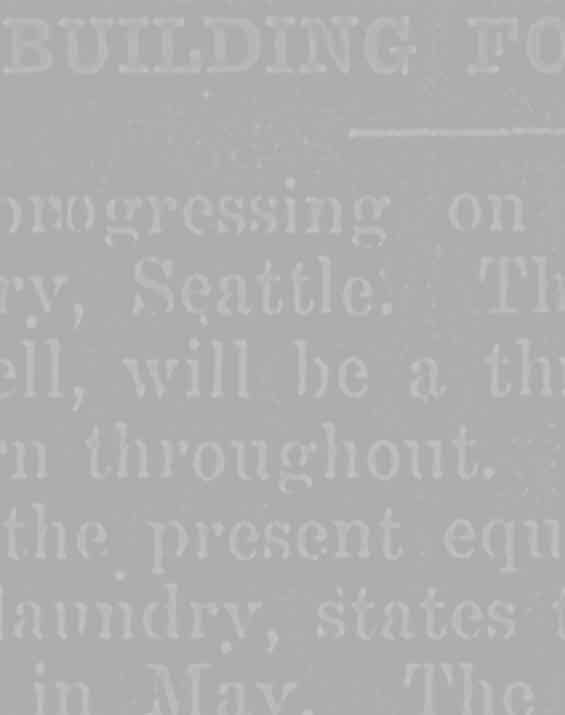 It is especially notable as the only laundry that continued to operate during Seattle's famous General Strike of 1919. By 1998, however, it was home to a health club, with an entirely new facade and altered entrances. By then the original window bays no longer existed. The Washington Laundry was not mentioned in 1988's 15-page Seattle Landmark Nomination of the Lake Union Power Plants complex, which are visible on its right in in both photographs. Successfully designated, by 1998 the redone complex housed the biotech firm Zymogenetics. Although the nomination of this complex treated the block above as a historic exemplar of steam technology, it never mentioned that a steam laundry occupied one part of it. In 2000, the same party evaluated the New Richmond Laundry for landmark status, with an evaluation stating it did not meet landmark criteria.